Tall Fescue. Wonder Grass or Toxic Curse? Tall Fescue is a plant of incredible importance to the Beef Industry across the Mid-Atlantic, Upper-South and Lower Mid-West. It is dominant from the Piedmont Region of the Eastern US all the way to Eastern Kansas and Oklahoma. In the east it runs from mid-Georgia north to Pennsylvania, and in the west it runs from Oklahoma to Kansas. That region, about 1000 miles long and about 400 miles deep is called “the Fescue Belt” and it is a region that is home to about 1/4 of the nation’s beef cows. When you take that into account, along with other areas of the US where tall fescue is adapted (the Great Northwest) and the dominance in other countries around the world, it is one of the most important pasture species on the planet. Our dominant variety, Kentucky-31, was discovered by a farmer named W. M. Suiter in Eastern Kentucky on a farm that he had purchased with the grass present. He observed that this grass was very vigorous and stayed green long into the winter after other cool-season grasses had turned brown. He collected seed from the grass and started planting it and expanding his seed supply. The “wonder grass” was present in Menifee County, KY on a number of farms and was known as “Suiter’s Grass” locally when E.N. Furgus, a professor at University of Kentucky, heard about “Suiter’s Grass” when he made a trip in 1931 to the county to judge a sorghum show. He recognized the potential value of such a plant to the livestock industry so he obtained seed and planted it at the University, initially in test plots, and later in on-farm demonstrations. In 1942 the variety Kentucky-31 was released and it quickly spread across what is now the fescue region. The rest of the story you might know well, but to cut it short after widespread adoption of tall fescue problems started to arise characterized by cattle that were rough hair coated, slow to breed back, slow to shed winter hair in the spring, and that were intolerant to the heat of summer. Also, some cases of severe lameness in winter were reported. These symptoms are collectively known as “fescue toxicosis”. Eventually it was discovered that the plant looked so good because it contained a “toxic endophyte” that caused livestock to not want to graze it (protecting it from overgrazing) and helping it to withstand pest pressures. Once the endophyte was discovered and we started to learn about the effects of the ergot alkaloids produced by the fungus, endophyte-free (E-) fescue was released and progressive farmers killed a lot of Kentucky-31 pastures and planted the new varieties. Unfortunately many of them found that while the E- fescue produced much improved animal performance the plants did not persist, and many fields were rapidly reinvaded by toxic (E+) fescue. As many of you know I raise cattle on a couple of farms north of Raleigh (near Virgilina, VA), where I have been actively involved in the farming operation since I was 8 years old. Kentucky-31 was the dominant grass on our farms then, but it is important to note that the pastures were not all fescue, but had a lot of orchardgrass, bluegrass, white and red clover, lespedeza and dallisgrass. Later I learned that the pastures had been planted with a mixture of these species in the late 1950s, and that was the most common approach to planting pastures in those days. As time went on, the tall fescue became more and more dominant until I started farming in 1981 when all the pastures had a very high percentage of KY-31. When I was growing up I worked here on the farm during the summer and in Autumn, Winter and Spring I lived in Arizona and worked some on several ranches there. It was interesting to me that our cattle in the east never looked as good as the cattle on those rough and dry rangelands. Like many of our neighbors when were learned about the potential for E- tall fescue we thought about it, but resisted planting any simply because it didn’t make sense to spend so much money to kill what looked like really good pastures. I think it came down to the fact that none of us had ever seen cattle on our farms that were not impacted by toxic fescue, so we just didn’t know what was possible and didn’t really know we had a problem. 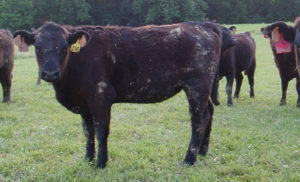 At that time, in the winter of 1981, I first stockpiled fescue and grazed cows on it it through the winter using the strip-grazing technique. It was hard to do before good reels, polywire, tread-in posts and such, but it still was one of the most amazing winter feeding options I had seen up to that point. After that experience we were convinced that the benefits of KY-31 outweighed the problems and didn’t consider E- fescue again. I only farmed a few years that first spell and then returned to AZ to go to graduate school. I learned a lot about feedlot beef production and nutrition and only returned to the farm several times a year. During the 1980s we had several historical droughts, and in my absence many of the pastures were severely overgrazed. By the time I graduated and returned to North Carolina in 1990 to take my current job our pastures had converted to nearly 100% tall fescue. I started working with the herd with a more critical eye than I ever had, and over the years became more and more concerned about how toxic tall fescue impacted our cattle. It seemed the better the bulls we bought the worse the problem became. Eventually I learned that it was because the “better” genetics available were mostly from outside the fescue belt and there is a big genetic variation in how cattle tolerate the toxins. Today, the fescue problem only continues to get worse due to a warming environment which has pushed tall fescue higher in the mountains and farther north in the fescue belt. Also, genetic improvement has moved fast and a lot of fescue intolerance has been bred into the cow herd in the region. There are several things you can do to improve the situation from the animal side including having a good mineral program, doing some supplemental feeding, and doing genetic selection for fescue tolerance. On the plant side you can diversify pastures by planting something other than tall fescue (native warm season grasses, bermudagrass, etc.) or by planting non-toxic “novel endophyte (NE)” fescue. The NE fescue varieties were developed in the 1990s when Gary Latch of Ag Research New Zealand and Joe Bouton of University of Georgia met and started a collaboration that led to the release of Jesup MaxQ fescue which had excellent agronomic traits like E+, but supported the animal performance of E- fescue. Dr. Jim Green and I conducted a study that started in 1999 at the Butner Beef Cattle Field Laboratory that ran 5 years and showed that Jesup MaxQ had great potential for long-term persistence. It was not quite as competitive as E+, but this allowed some more space for clover and other desirable grasses, while reinfection with E+ did not occur. Animal performance on MaxQ matched or exceeded E- fescue. Today there are some 6 commercial varieties of NE fescue being marketed, with more set to come on the market. Several of these are better than the original Jesup MaxQ, so farmers have quite a few options when selecting something to plant. As many of you have heard me say, nearly all progressive cattlemen with fescue pastures should convert at least some of their ground to NE fescue. 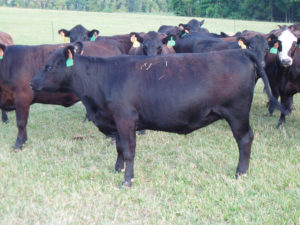 While I am still a big fan of KY-31 for winter grazing, hay production, etc., having non-toxic fescue for the weaned growing calves and developing heifers will provide major production advantages. To help farmers that are seriously interested in converting some of their pastures to NE fescue we have been working with a group formed in Missouri called “the Alliance for Grassland Renewal”. This group was formed by Missouri Extension and is composed of Universities in the fescue belt, the seed companies selling NE fescues, some other related businesses, and several non-profit groups (including the Nobel Research Institute). The goal of the group is to develop a self-imposed system of regulating seed quality, and to develop educational programs to support producers in conversion projects. They have been doing the educational workshops in MO for 5 years, and we are excited to work with them to bring the program to the east coast this year in March. We will have workshops in South Carolina, North Carolina, and Virginia from March 13-15, 2018. The program focus is to help producers that will be planting NE fescue pastures in the fall of 2018 to be successful. The speakers will include a list of very experienced scientists and industry representatives that have great information to deliver. I have planted some NE fescue at home, but have a long way to go to meet our goal of having 25% of our pasture in NE fescue. I understand the things that keep me from moving faster, and basically it is primarily a fear of killing good pasture and then failing. My New Year’s Resolution is to make a major dent in our goal this next year. We killed the toxic fescue on one of our best pastures and have been planting annuals there for several years which was a good way to get started. Essentially it was easier for me to kill some toxic fescue to plant annuals than to do it to convert to NE, although that was the eventual goal all along. This fall we will be planting about 30 acres of NE fescue to complete that first project and have already started killing additional pasture and planting annuals. While I am preparing to speak at the workshops on the economics of conversion, I also really look forward to getting the most up to date information so that I am confident enough to get the job done right at home next fall. If you have decided to plant some NE fescue or are seriously considering adding it to your system, don’t miss out on this great opportunity to hear from the best people in the country on the topic. March 15. Raphine Volunteer Fire Department, Raphine, VA. The program flyers with details and the agenda are available on the NC Cattlemen’s Association website and the Amazing Grazing website, as well as forage websites at VA Tech and Clemson. If you are a progressive cattlemen with a fescue-based system, attending this workshop will change the way you look at tall fescue for good. It will help you understand how you can continue to enjoy the benefits of the wonder grass, KY-31 tall fescue, while reducing issues with fescue toxicosis by adding some novel endophyte infected tall fescue to your system. Written by Dr. Matt Poore for the Carolina Cattle Connection and Virginia Cattleman, December 2017.